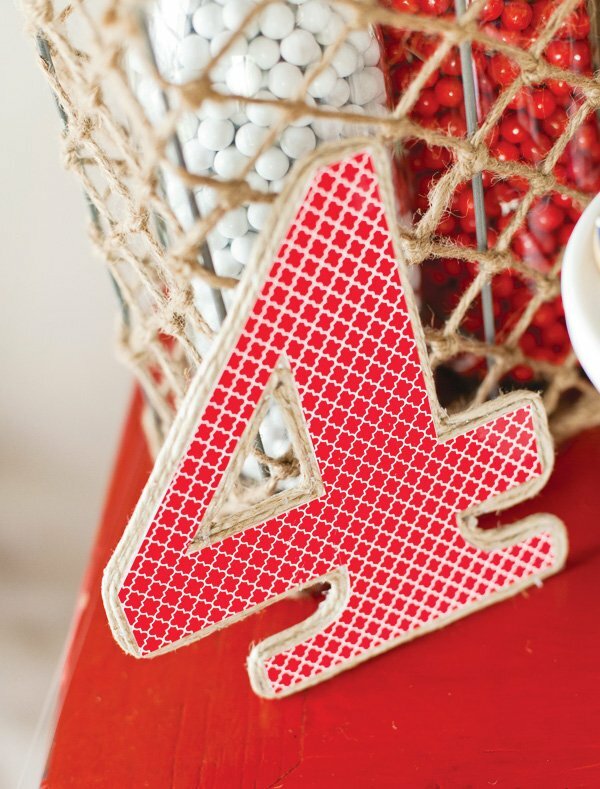 HWTM Contributor Maureen Anders of Anders Ruff here, and I’m getting super excited for the upcoming holiday! 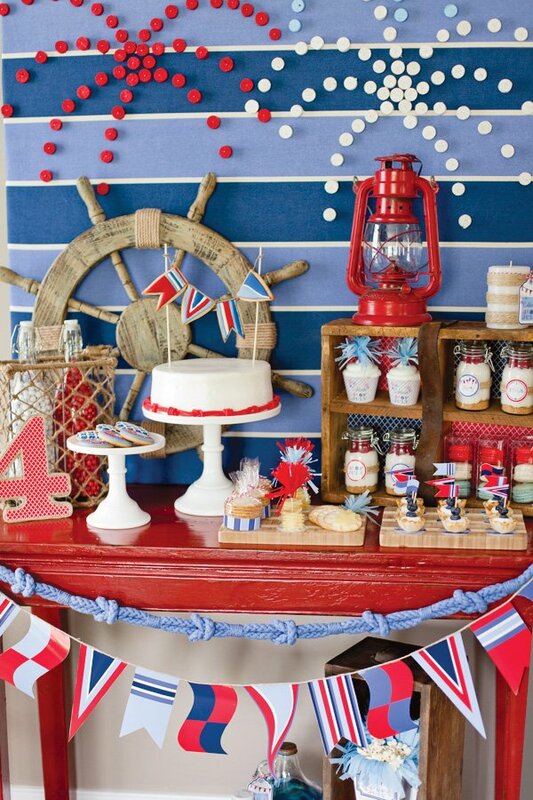 Last year we created a patriotic pinwheel inspired party for Independence Day (check out the full party album here), and this year we were inspired by nautical details like ropes, anchors & ship wheels. 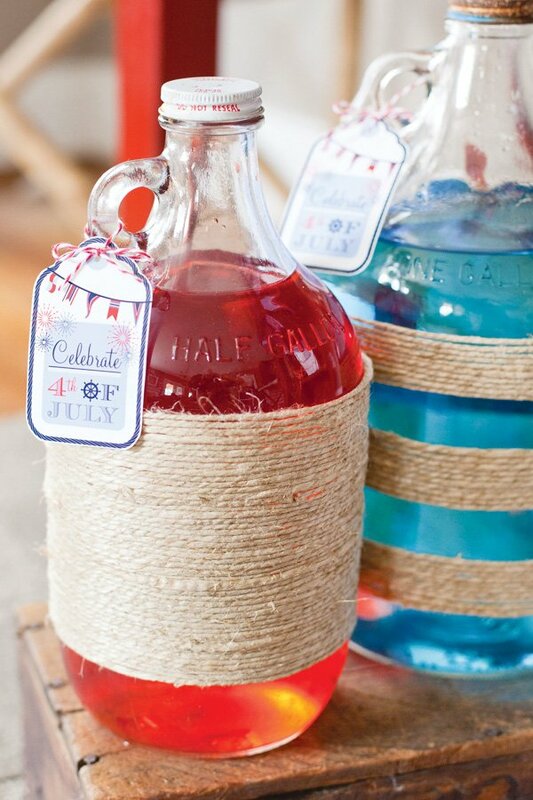 I hope you like how these nautical 4th of July party ideas turned out and find some inspiration here for your own celebration! 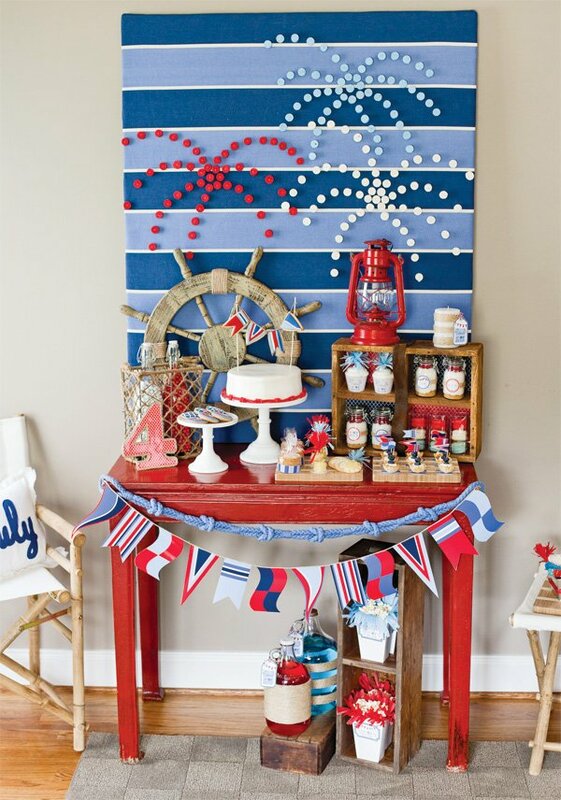 – Cork Firework Backdrop Craft: Keeping with the “nautical” concept, we wanted to incorporate corks. We made a backdrop using re-purposed wine corks. We cut them into 1/2″ slices first. Then we threw them in a ziploc bag with acrylic paint and shook them around. Laid out to dry on wax paper. When they were dry, we used straight pins to push through the cork and into the backdrop board (which was made of foam core). 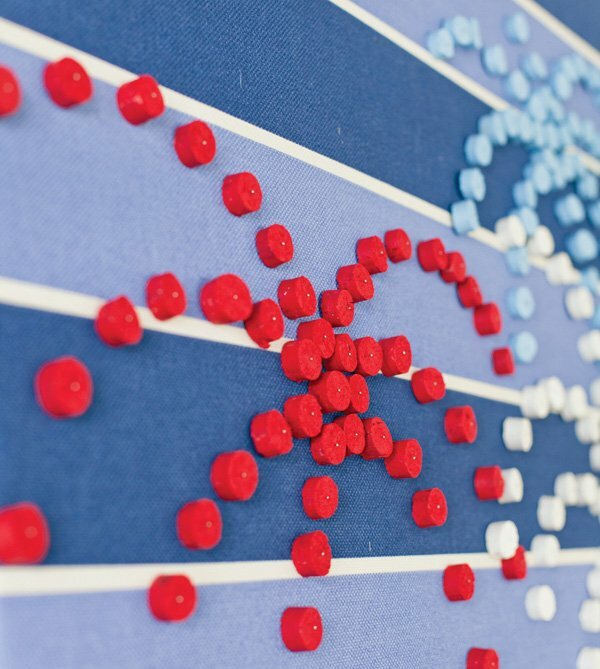 (Homemade tacks, really) We arranged them to look like firework mosaic on the backdrop. 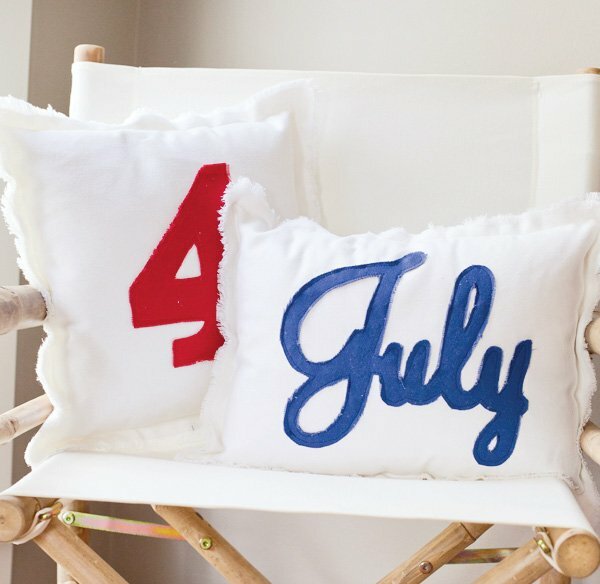 – Applique Pillows: We used our printable “4” and “July” to create a template to cut out fabric. We stitched it onto white denim fabric and frayed the edges. 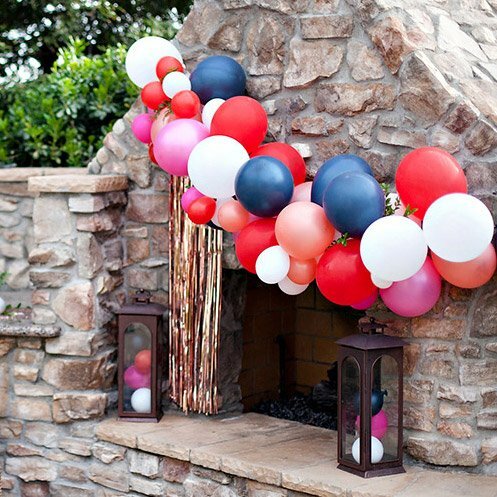 – Homemade Rope Cake Decor: we dyed shoelaces red, and tied knots to create a rope garland for around the cake. 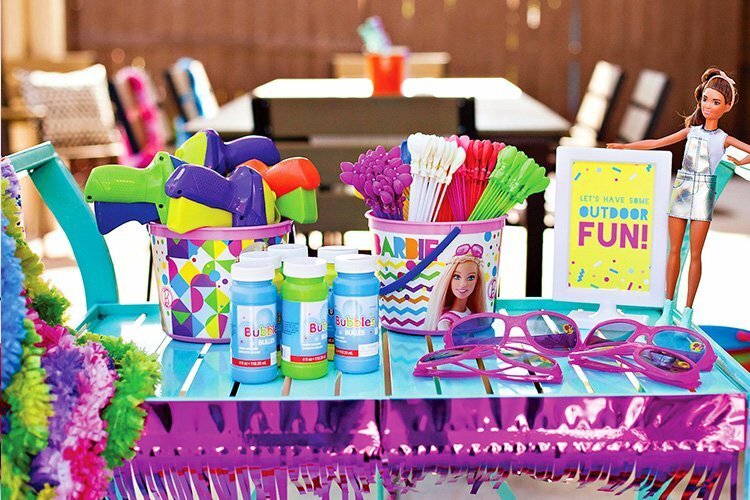 It replicated the Polo brand rope garland on the front of the table. 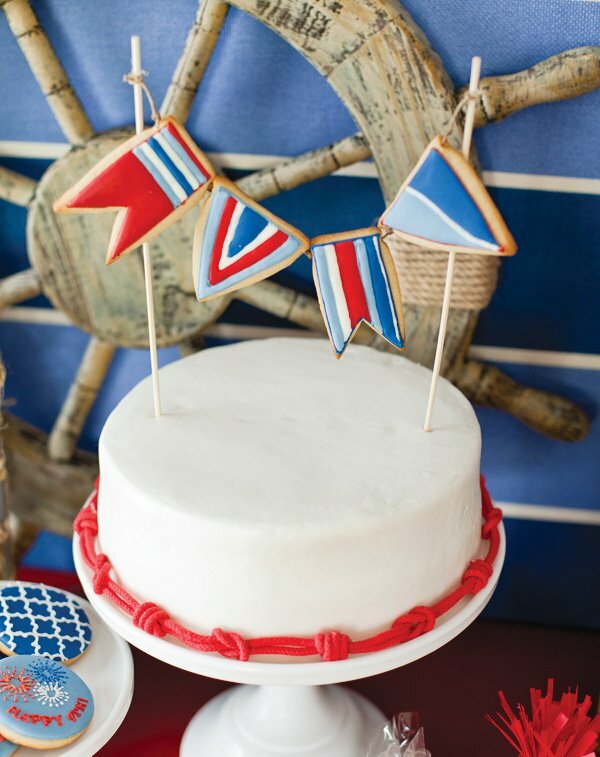 – Cake bunting: Firefly confections made pennant cookies on string for a cake bunting. 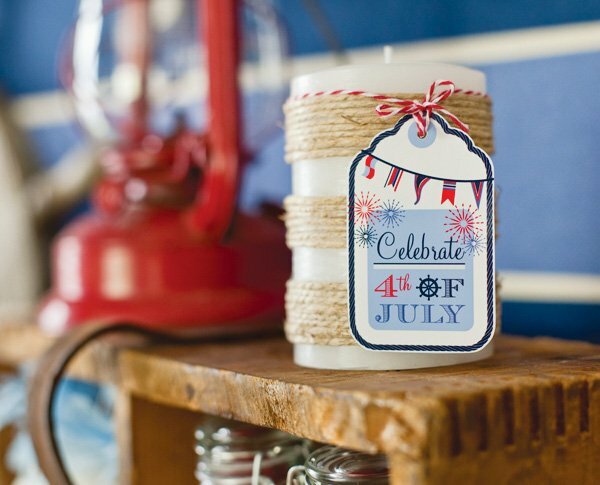 – Twine wrapped candle favors embellished with our printable favor hangtag. – Tissue paper firework cupcake toppers. 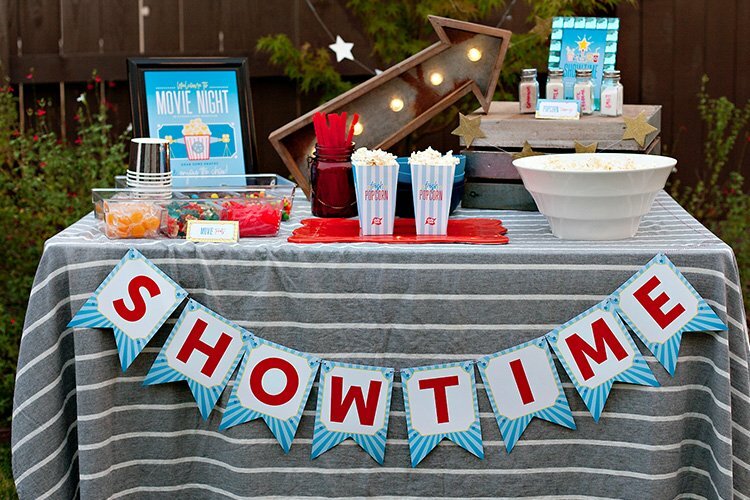 – Popcorn Boxes with fringy trim. 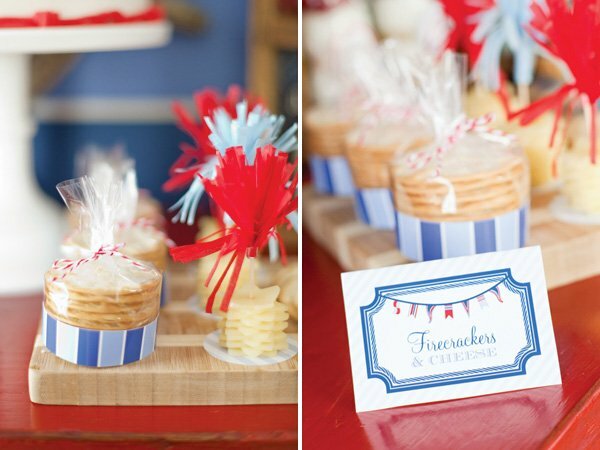 – FireCRACKERS and Cheese: We packaged round crackers in cellophane and added printable wrap to the base. Tied with twine. 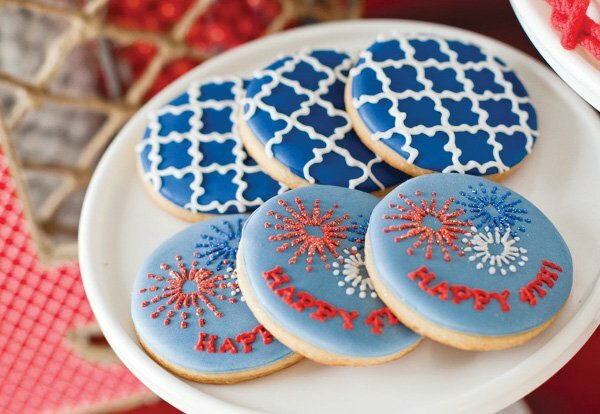 Star cookie cutters were used to cut cheese and we stacked them and topped with a tissue “firework” toothpick. 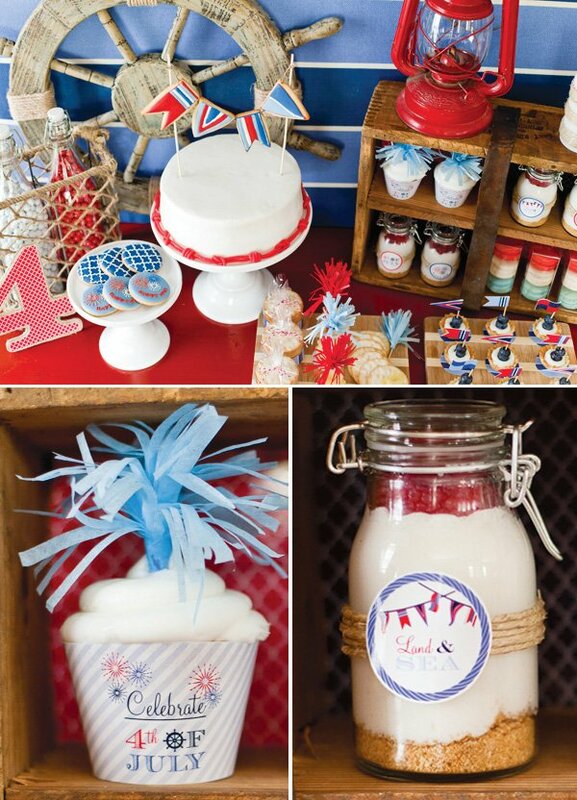 – Red, white and blue macarons: packaged in clear boxes from Nashville Wraps for favors. 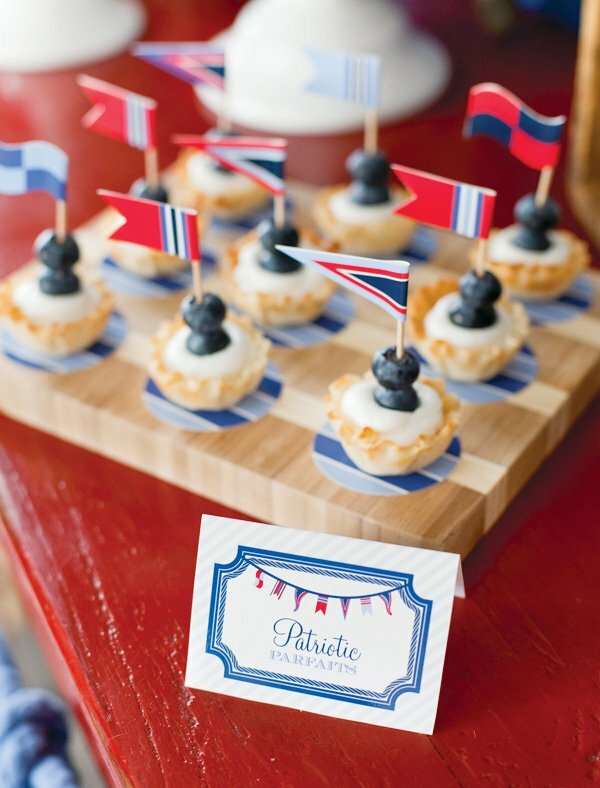 – Blueberry Patriotic Parfaits: Phyllo Cups with yogurt and blueberry, topped with a party flag. – Pie in a jar with twine wrap: Graham cracker crust, white chocolate mousse and raspberries on top. 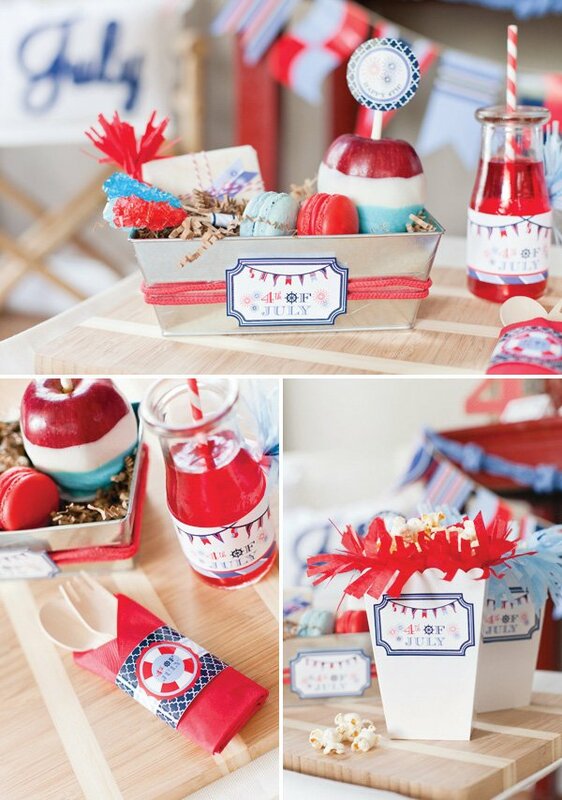 – Galvanized lunch boxes: DIY Chocolate apple, macarons, sandwich and rock candy. 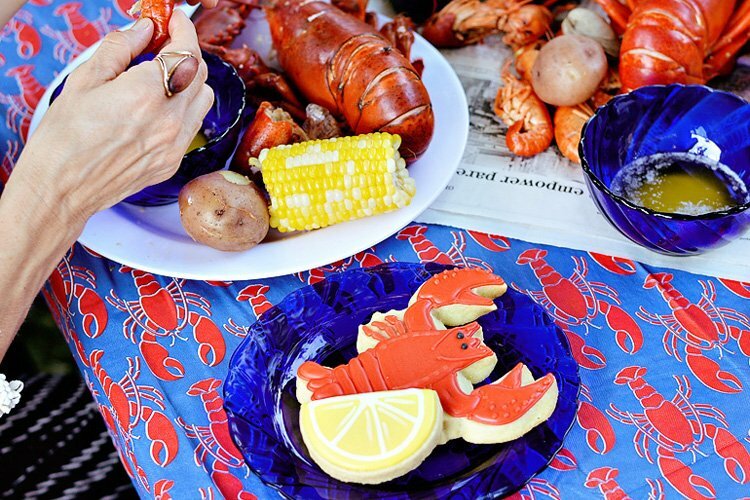 The colors… The details… The creativity… The American pride!!! Nice Creativity which you have showed here really great work. 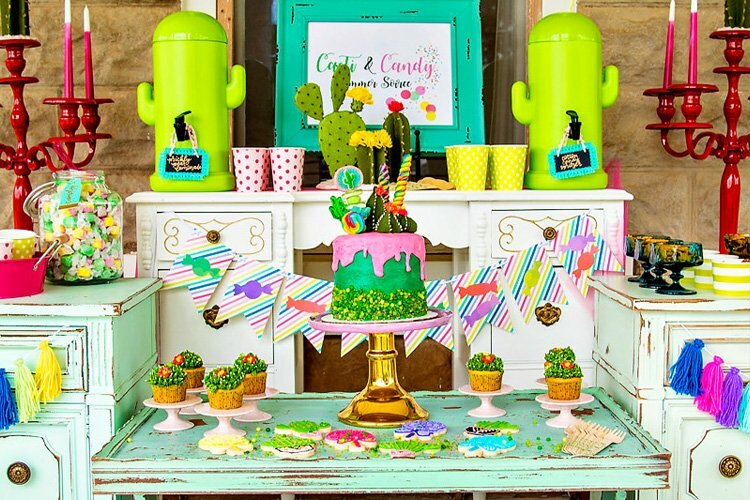 Completely different ideas of the decoration.